Orange County, Calif. – CND partnered with Advance Beauty College (ABC), for this year’s Tet Festival and Little Saigon Tet Parade on Feb. 12 – 14 to honor the Vietnamese-American community and its tremendous contributions to the professional nail industry. Legendary actress, humanitarian and pioneer of the Vietnamese-American nail professional movement, Tippi Hedren, and Vietnamese-American actress, philanthropist and Lifetime Achievement Awards recipient, Kieu Chinh, joined CND and ABC in their mission on Sat., Feb. 13th. Community members who attended the festivities received an exclusive sneak peek at CND’s upcoming product launch, Creative Play Nail Lacquer. A celebration of the Lunar New Year and the spring season, UVSA's annual Tet Festival is a three-day weekend event that immerses over 60,000 visitors in a vibrant array of live entertainment and cultural displays. Over one million dollars in festival proceeds have been awarded to non-proﬁts in the community throughout the years. The Little Saigon Tet Parade takes place during the Festival weekend and similarly aims to celebrate the Lunar New Year while preserving and promoting Vietnamese culture to the younger generations and the greater community. 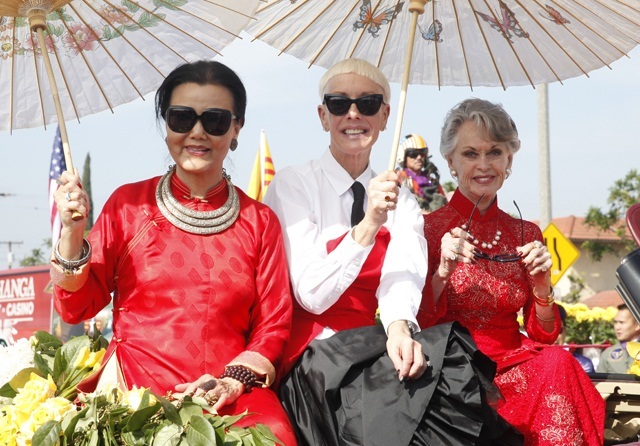 "It was such an honor to have Tippi Hedren and Kieu-Chinh join us for this important celebration. These two women represent beauty, philanthropy and strength, and are an inspiration to both CND and our fans," said CND co-founder and style director Jan Arnold. "In the same spirit, CND is proud to make a donation toward meaningful initiatives to the Vietnamese-American community in the name of Creative Play Nail Lacquer. We will be announcing additional details after the official launch in April." For CND’s debut appearance at Tet, guests of honor Hedren and Kieu Chinh joined the parade ensemble and attended a fan meet & greet at the brand’s exhibit booth. The parade display featured Hedren, Kieu Chinh and Arnold in a black 1939 Lincoln Zephyr, followed by a CND-branded van and float; CND education ambassadors John Nguyen and Michele Huynh, and over 50 students from Advance Beauty College walked alongside the vehicles, while distributing Creative Play Nail Lacquer samples and branded t-shirts to the crowd.